Sometimes you may forgot the password of the intouch, but in some reason, you can’t just delete the password stoage file to reset all the account password, here is our solution. We made a utility to recovery the Intouch standalone project Password. 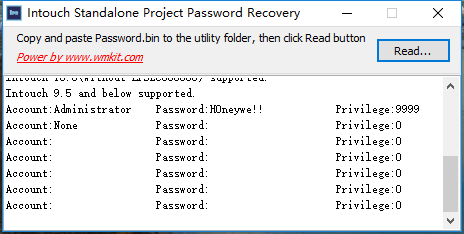 1.Copy the password.bin file from Intouch project directory to the utility folder. 2.Run the utility, Click the button “Read..”, all the password will show. 1.The project generated by the Intouch installed the LFSEC000080 patch will not be recoverable. 2.You must have a USB flash disk to Run this utility and keep the license. 1、This utility is a shareware, so you need a ItPassRecovery license to start the ItPassRecovery. 2、ItPassRecovery will enter Demo mode without license, in Demo mode, the password will start with *. 3、You have ONE week to evaluate this utility on every computer, after that, you will not be able to start this utility. 4、The ItPassRecovery license must be placed together with ItPassRecovery. 5、License will be binded to the USB flash disk, and you must not change the partition state of the USB flash disk. 6、We need your HardID to generate the license, you can find it on the ItPassRecovery. If you dont need the old password, you can delete the password.bin to regenerate a password.